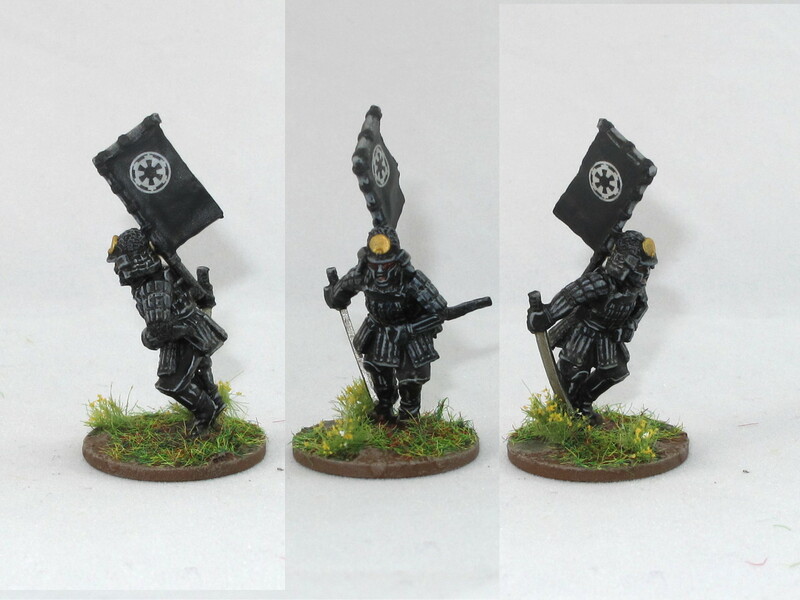 Ok, no prizes for guessing the slightly silly theme for these two warbands (“buntai”) for Osprey’s Samurai game Ronin. Any Star Wars geek should spot the symbols for the Empire and the Rebel Alliance pretty much straight away, and to be honest it was these that gave me the idea for them in the first place. On one side we have the armoured and uniformed troopers of the villainous samurai Dasubeda, who are opposed by the plucky rebels of an Ikko-Ikki led by Han, Tsubaka, Ruka and The Princess. Hopefully I won’t be having the trademark-enforcement SWAT team from Disney kicking in my door and tasering me over this. George Lucas admits he was hugely influenced by Japanese Samurai movies when he wrote Star Wars (especially Kurosawa’s Hidden Fortress), and some of the aesthetic draws straight from them. In particular, the way the Jedi are dressed and the round mon symbols of the empire and rebels are pulled straight out of C16th Japan, so morphing it back the other way and doing Star Wars in the Sengoku Jidai isn’t exactly a stretch. This is a pretty simple warband, using entirely Perry miniatures and the profile of a “bushi” warband (ie: professional soldiers). The leader is a Rank 5 samurai, the dastardly Dasubeda. In Ronin I’ve given him the traits Fearless (which is essentially immunity to morale effects), Kenjutsu and Yadome-jutsu. So this guy is unflappable and a phenomenally good swordsman who can deflect arrows. Boxed up inside heavy armour he’s an absolute combat monster in hand-to-hand. The balance of the mob is an anonymous horde of ashigaru, split between spear and arquebus. I chose the latter over bows as the empire always went for the high-tech approach, and teppos in Ronin are very slow to fire meaning these guys will generally deliver a fusilade of shots that will all miss the heroes. Insert stormtrooper marksmanship joke here! The best fit for a “rebel alliance” in Sengoku Japan are the Ikko Ikki (“Single minded league”). These were organised rebellions against Samurai rule formed around a branch of the Buddhist religion and drawing in peasants, warriors, and monks into rag-tag but feisty armies. They tried to oppose the military dictatorship of the samurai class, and while the samurai were still fighting among themselves they managed to be a major thorn in their side. The best fighters are a pair of samurai and a warrior monk. Classed as samurai, but really more like ronin are the Rank 3 warriors Han and Tsubaka. The former has the attribute “fast” while the latter has a naginata and the “yojimbo” or bodyguard rule. Fighting together they are pretty fierce. Han is a Perry samurai, and Tsubaka is actually a Dixon sculpt (he’s supposed to be a bit chunky fella, after all…). The third Rank 3 model is a the warrior monk Ruka Sukai-oaka (say it quickly). He has “intuition” which gives him a free defence token every time he fights (so effectively bumps his combat pool up to four). Nasty. He’s a Perry miniature from their Ikko Ikki range, which is nice and diverse. The last of the heroes is the Princess, who is a Hasslefree miniature. I decided to slot her in as a Rank 2 fighter, but without armour. This makes her fairly delicate and vulnerable to arrows, but more than able to hold her own against many opponents in a sword fight if she has to. The rank and file are a mix of Perry spearmen and The Assault Group archers, with a Perry banner. The rebels in the movies use a couple of different uniforms for their squaddies (eg: camo on Endor, white on Hoth), I went for the classic grey sported by the unfortunate sods from the boarding scene in the original movie. And last (and quite possibly least) we have this odd couple. The ikko ikki were a grass-roots rebellion, so have the option to take peasants in their list. As Rank 0 peasants these guys would struggle to fight the skin off a rice pudding, but they’re absurdly cheap and fit the theme. To be honest, they’re the hardest to shoehorn into the theme, because they should really be droids. As such bad fighters they’re mainly there to be part of scenarios (perhaps one has the stolen plans for Dasubeda’s castle?). They’re Perry peasants, the “Threepio” is one of the oddball travelling monks known as komuso. The basket on the head was supposed to signify the absence of all ego, and they travelled the country playing the flute for alms. The Artoo guy is another Perry monk with a dome-shape travelling hat. One thing I discovered in painting these two warbands is just how muted the colour pallete in Star Wars is. If I was painting these historically they’d be far more colourful than this mix of greys, whites and blacks. On the plus side, I’ve had to practice painting black and white, which I hate. Results are a bit iffy, but I’ve learned a lot doing it. I had to do a double…no triple look at the logos on the small flags…genius! Pretty easily done, too Greg. Andy, this is absolutely fantastic! Love the SW theme too, very cleverly done. Really looking forward to seeing how you get on with Ronin. A few years back I had the rules and two sets of figures but eventually ebayed the lot. Doh!? I’ve enjoyed Ronin before Matt, but the recent buzz around ToH has given me a push to get some half-finished stuff completed. Good little set of rules. Gaming at this level is all about the scenario, I like that Ronin is flexible enough to allow you to be quite creative. Andy… what’s “ToH” ? Cheers, Matt. Test of Honour, a new game-in-a-box thing from Warlord.